How do you feel about charging for the work you do? If you’re like most of my clients, getting paid appropriately for your work is something you struggle with. There’s this notion that doing “good work” should be reward enough – that getting paid somehow tarnishes the sincerity of the work, that asking to be paid “proves” we aresn’t in it for the “right” reasons. And this isn’t just something you hear from other people… it isn’t other people you have to convince to value your work. As a change-maker, this is something you have undoubtedly struggled with yourself, internally… and it doesn’t help that you’d more than willingly do the work you do for free (if you could). Which is why so many change-makers struggle with money and making ends meet. Way back when, “good work” – work that makes the world a better place – was primarily the purview of religious devotees; monks, nuns, priests, etc. As a member of a religious order, you would have been housed, fed, and clothed by the order itself, which was in turn supported by the community it served. But the payments made by the community were seen as tithes to the religion’s deity, or as donations to help the church help the less fortunate. Rarely, if ever, was there any connection made between the work done by the devotees and the payments made by the community. For those religious devotees who’s work involved teaching others the wisdom they had gained, it was considered especially inappropriate to charge for what they taught – after all, it wasn’t their knowledge they were passing on. They were simply sharing what their deity had shared with them. And then, of course, there were Vows of Poverty. Poverty was seen as being a noble, spiritual practice. Money was, after all, the root of all evil. Those who had devoted their lives to the betterment of mankind were expected to give up material comforts – service to others and the favor of their deity were their rewards. By “giving up” the pursuit of money, it was believed that you could devote yourself more fully to the pursuit of meaningful work. Art has been another venue for those who wish to change the world; there’s a deep, visceral power to art, to the visual representation of ideas. Whether it’s purposely political in nature, or a “simple” act of sharing one’s own lived experience, so that others can connect, appreciate, and share that experience – art has power. Unfortunately, art also has a history of being a horrible way of making a living. But where does that history come from? In the 1850s, Bohemianism romanticized the “starving artist” archetype – viewing poverty as freedom from the corrupting power of the pursuit of wealth (much like religious devotees who take up vows of poverty). The ideal of “suffering for one’s work” was built up to the point where it was believed that you couldn’t be successful AND be an artist, as success would somehow tarnish your creativity and make your work meaningless. Those who did achieve success with their art were (and today still often are) considered “sell outs” – it’s assumed that the only way to gain popularity or be well paid for your work is to commercialize it, to give up “true” art in order to make something the masses will pay for. The only “acceptable” way for your art to be worth anything is if its genius is somehow discovered after you die. And then there are the “soft” professions; teaching, caring for others, even “lesser” healing work (i.e. women can be nurses, but men are Doctors). Historically, these professions are a vital part of the continuation of our species… and yet, they were considered “women’s work.” Which mean two things, above all else; they were not positions of respect, and they were not well paid. The care of others (whether the very young, the very old, or those who are simply unable to care for themselves) is arguably one of the most necessary professions in a caring society, but offers even less pay and respect than teaching. Healing work can bring better pay, and a slightly greater level of respect… but the hours tend towards grueling, and the emotional toll is high. Even if you aren’t engaged in one of these specific professions, the message remains; caring for the world is expected of women. We’re supposed to do this work, and shouldn’t expect much in return. Unfortunately, theory doesn’t always equate to reality. You’ve grown up swimming in the societal stories of meaningful work being a calling, not a career. And a calling isn’t something you “should” expect to be compensated for. Deep within, you still feel like you should be doing this work simply for the sake of the work. 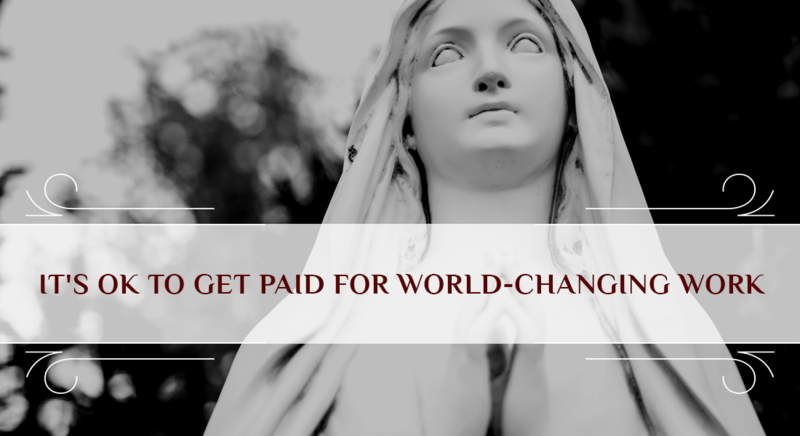 It’s a worthy cause after all… and besides, you don’t want to seem like one of those corrupt priests, the ones clothed in silk and feeding off the tithes meant to support the suffering. You’re afraid that asking for money will make it seem like you’re only in it for the money. That making any sort of “profit” will make the work you do less worthy. So you undercharge, you’re apologetic when explaining your prices, or submitting an invoice to be paid, and you cut your prices when someone can’t afford what you’re selling (even though it’s already underpriced). Because really, you’d do it for free anyway, right? Reality-check time; you can’t do your work for free. We live in a society that requires money. You literally cannot live without it. Money is a necessary part of modern life. You need it to pay for food, housing, clothing, transportation, pretty much everything. Which, trust me, drives me bloody batty sometimes. I WISH that I could just do my work, live my life, and never have to worry about money. But the only people who never have to worry about money, are people who have money. And the only way to have money (short of being born into it) is to ask for it. This isn’t the “way back when” – your needs, and the needs of your family, aren’t going to be provided for by an organization that’s supported by the community. You have to receive support directly from the community you serve. It’s the only way you can continue to provide your services. It’s the only way you can afford to do good work. Hopefully, by now you’re recognizing how flawed the “meaningful work should be reward enough” story is… but if you’re anything like most of my clients (and myself, I’ll admit), the idea of charging more than a pittance still fills you with guilt. I mean, ok, fine, you need money… but you don’t want to be greedy, and you REALLY want to help as many people as possible. And charging more than $X just feels… wrong. So you figure you’ll charge the bare minimum to get by. It’s not like you need that much money. Besides, you don’t want to be a part of the money-obsessed system that’s destroying our ecosystem, that preys on the weak and unfortunate. You want to be part of the solution, and charging “lots” of money feels antithetical to your values. Money might be necessary, but it still feels dirty. Here’s what I need you to know; it’s one thing to realize that money is necessary… but it’s not enough to just view it as a “necessary evil” that you can’t avoid. Money is neither good nor evil. It’s a tool, an alternative to the clunky barter system that our ancestors used in the past. If I raise sheep, I’ll have wool and mutton to trade. But if I need bread, and the baker only needs wood right now, I’d have to see if the woodcutter was willing to trade me some wood for my wool or mutton, so that I could then trade the wood for the bread I need. And if the woodcutter doesn’t need wool or mutton, then things start to get really complicated. But if I can sell my wool and mutton to whoever needs wool and mutton, in exchange for something that everyone is willing to trade for, I can take that something and get all the other things I need. And that’s ALL it is – the “something” that you can use to get the things you need that you can’t produce yourself. It’s absolutely true that our capitalist society is money-obsessed, and being obsessed with money is absolutely one of the things that have led to many (perhaps all) of the ills plaguing our world today. But money is not the culprit. It’s simply a tool, and tools can be used for good or for evil. Corrupt individuals with ungodly amounts of money use their money to increase their own power and comfort, to the detriment of those “beneath” them. People like you and I, who are called to make the world a better place, can use our money to counterbalance the actions of those who don’t give a damn about anyone but themselves. But only if we have money to put to that use. There are many reasons it’s absolutely essential that you are paid WELL for the work you do. If you don’t have enough money to take care of yourself and your family, money stops being a tool, and it starts being a source of stress. When you’re stressed about money, you can’t focus your energy on your work, and when you don’t have enough money because you don’t charge enough, you end up resenting your clients. But when you’re well paid, when you have MORE than enough to pay your bills, care for yourself and your family, and cover unexpected expenses without having to worry about it? THAT is when you are able to compound the results of the work YOU do by supporting the work that OTHERS are doing. After all, no one person can fix the world’s ills – it’s going to take an army of us, supporting one another, supporting each other’s work. And the only way we can do that is if we have enough resources to take care of our own needs AND have enough left over to share with others. Granted, pricing is an issue that all entrepreneurs struggle with… even when they aren’t trying to save the world with their work. When you’re trying to balance “charging enough” and staying aligned with your values, it can feel like trying to solve one of those 20-sided Rubiks cubes. Blindfolded. To help you get started, here’s a rough introduction of the process I use with my clients (and in my own business). How much do you need to make in order to meet your own needs, and the needs of your family? What are the causes that you care about, and which organizations serving those causes do you want to support? Who are the other people doing work that you believe in, and how much would you like to contribute to their work? Put those two together, and you have an idea of how much you NEED to make. Now divide that by how much you CAN (or WANT to) work, and you have a rough starting point for how much to charge. It’s not fancy, and I’m sure plenty of other business coaches would scoff at the method, but it works. It gives you a rate that covers your needs, with enough “left over” to support the things you care about. Which means it’s a rate that you can feel good about quoting to potential clients. You know that it’s fair, it isn’t arbitrary, and it allows you to do your work without worrying about money OR resenting your customers. And when you feel solid in your prices, you can convey those prices in a way that feels solid to your customers, which makes them feel more confident about hiring you. Of course, the process above is just a rough outline of my Pricing With Integrity model – if you’d like to see the step-by-step process, sign up for the newsletter. I’m working on a workbook that will show you exactly how to figure out your pricing, whether you’re offering hourly services, flat rate pricing, or physical goods.